Today at the office the phones keep ringing, junk emails keep popping up on my screen. Our distributors won’t let us sell in the UK and someone in Arizona can’t find the charger for the quadcopter they just ordered, even though I sent him pictures of where is it in the packaging. My boss doesn’t think I have enough to do, my to-do list says otherwise. I close my eyes, take a deep breath and I’m back on a train to Slovenia. I admit the idea was a little crazy–jump on a plane from Los Angeles to Washington D.C., another one from D.C. to Frankfurt and still another from Frankfurt to Budapest. Pray fervently that none of the planes are late, joyously hug Mo at the Budapest airport and flag down a notoriously sketchy Budapest Taxi to rush us to the Keleti train station in time to hop on the 11:10am train to Bled, Slovenia. 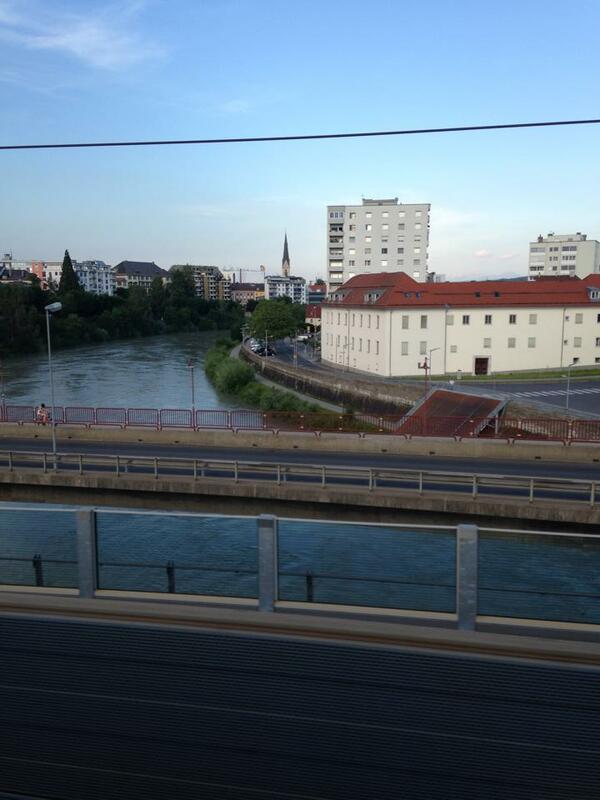 Change trains in Vienna and again in Villach, again ardently praying that the trains will run on time. Hopefully arrive at the Lesce Bled train station in time to catch a bus for the 2.5 mile drive into town. Mo and I had mapped this nutty route out with the idea of cramming all the travel on my short trip into two days, starting in Slovenia and working our way back to Budapest, but, par for the course with our usual crazy schemes, I don’t think we quite realized how insane we were. But it worked. Somehow, shockingly, it actually worked. Buddy pic! Me and my first plane. I can’t sleep on planes. I dozed for a few minutes while watching The Grand Budapest Hotel somewhere over the Atlantic, but by the time I touched down in Budapest everything was beginning to look a little surreal. After our joyous airport hug Mo and I flagged a surprisingly nice sketchy taxi that didn’t overcharge us too much. We said that we needed to go to the Keleti train station and he immediately responded ‘the 11:10am to Slovenia? No problem.’ And it wasn’t. The guy drove like a maniac, but we got there in twenty minutes. I love old train stations and the Keleti station is truly a relic. It is a hulking mass of a building that would look elegant if half of it wasn’t boarded up or under construction. Stacks of brick and chunky arches reach toward dusty glass ceiling panels. Dirty blue regional trains hunker down on the tracks. The whole scene was an Eastern European time machine. To what time, I’m not sure. Just back. Like a Wes Anderson movie. After re-assuring the nice woman at the counter that we did indeed want the more expensive train tickets for the 11:10am train rather than the cheap train that would get us into Bled at 1:00am (Oy! I took a taxi and bought a more expensive train ticket. 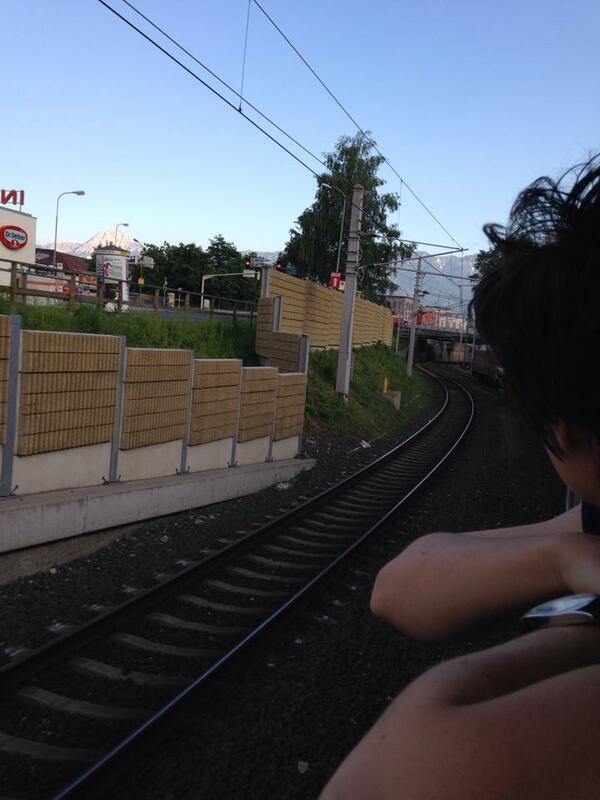 There was a little draft in Hell that day) we boarded our train to Slovenia. Trains are by far my favorite way to travel. There is no better way to see a vast swath of countryside, climb vast mountains, amble along beautiful lakes, rivers, and beaches. Many European trains still boast Harry Potter-esque private compartments and a dining car so if you are lucky you can stretch out in a four man compartment and enjoy a beer while the countryside rolls by. A nine hour plane flight feels like two hundred years in a stasis chamber. Nine hours on a train through the alps feels like a two hour trip to Hogwarts. At first I have to admit the scenery was a little disappointing. I didn’t realize the plains of Hungary were going to be so, well, flat. I guess the Magyars settled there because flat land is wonderful for growing things, but in my opinion they should have picked a region that didn’t look quite so much like East Texas. Our first train also was very full and the nice lady at the Keleti train station had tried to save us money again by not suggesting that we make a seat reservation. Most Eastern European trains sell unlimited tickets with first-come, first serve seating. You can purchase an optional seat reservation option for a few Euros more or you can decide to skip the reservation and take your chances that the train won’t be fully booked. If it is and you can’t find a seat you can either a) stand or b) nurse a beer in the dining car until the waiters kick you out. We decided to do the latter. Beer at 11:30am is completely justified if you can’t find a seat, right? Luckily our train from Vienna to Villach was much emptier and we were able to find a mostly empty compartment without any problems. I wanted to sleep, but I couldn’t help but admire the beautiful alpine scenery sliding past my windows. Green hillsides dotted with tiny one-room cottages decked out with neat shutters and window boxes full of geraniums. I couldn’t tell vacation destinations or actually someone’s house. Everything looked so pristine and cutely Alpine I couldn’t tell whether I was actually training through Austria or touring the inside of a cuckoo-clock. Needless to say, I was in heaven. Finally near 8:00pm we pulled into the Bled train station and was greeted by its adorable Alpine facade. We hopped onto the bus and wound through an easy drive into town. We found our hostel and, after checking in, went to wander down by the lake. 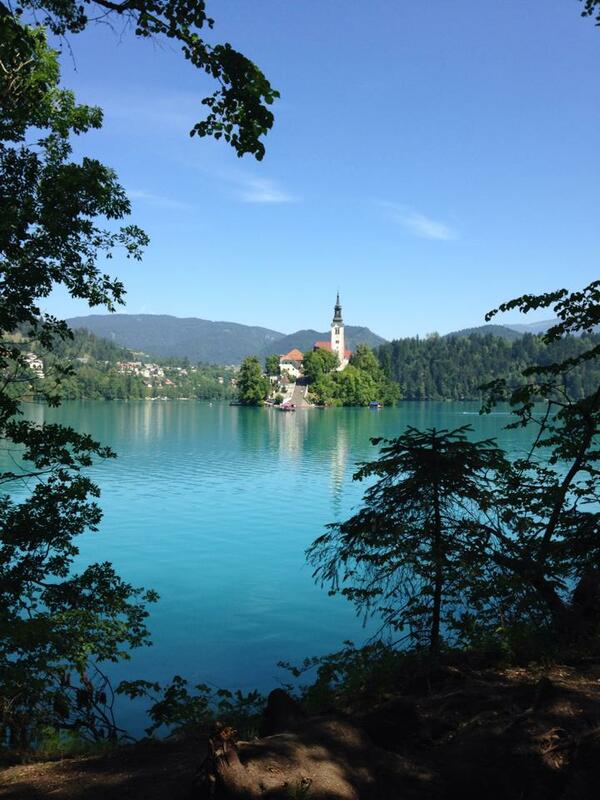 Lake Bled is a crystal blue alpine lake framed by trees with a medieval monastery perched on an island in the center. A castle perched on a cliff towers over the scene. In the dusk everything was peaceful, magical and I realized I had finally reached my destination–a little town far, far away from Los Angeles, CA. 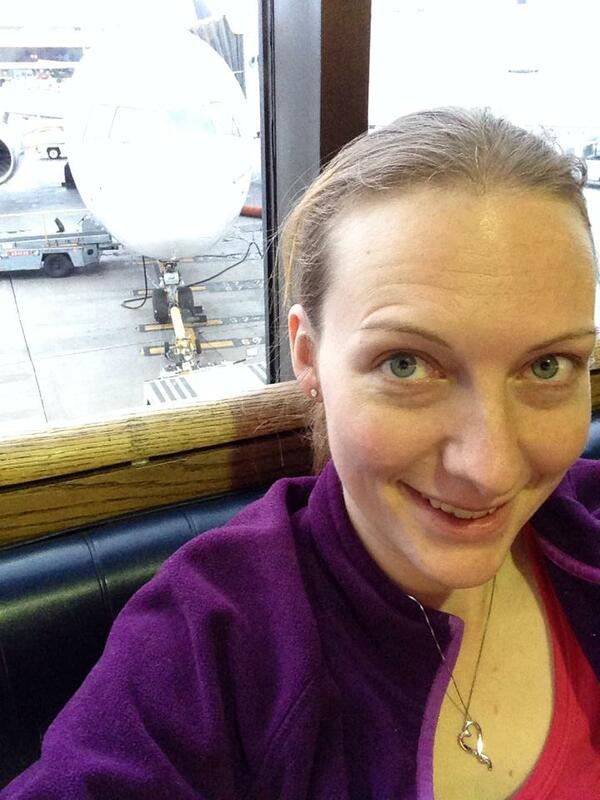 Posted in Places I Go, Weekly Awesome.Tagged adventure, europe, Hungary, plane trips, Slovenia, train rides, travel. Hi Jill from sloveniaforyou.com ! We have posted your blog on our FB page 🙂 make sure you take a really long holiday in Slovenia next time as you will have the best time. Hi Greg! Thank you I will be posting more of my travels in Slovenia soon. It was a wonderful trip and I hope to visit Slovenia again in the near future. The scenery was so beautiful and the people were so kind and hospitable– such a great country! Wow, what a journey. Eastern Europe is on our list – this makes me want to move it closer to the top. Sweet.